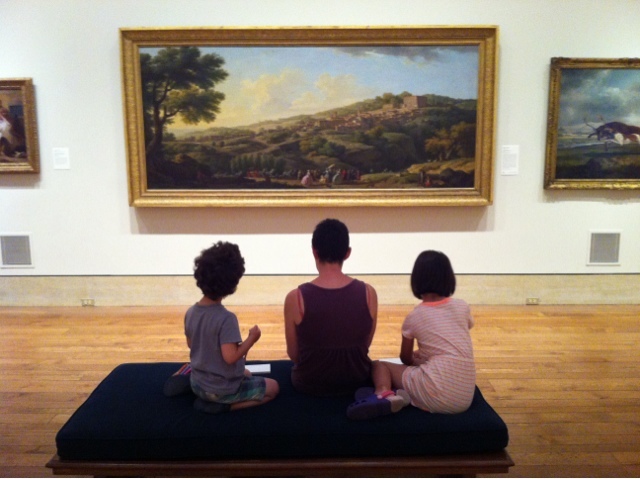 The first Sunday of the month the Philly Art Museum has some nice deals and kid friendly activities. We romped on over, pencils and paper in tow (after an exhilarating 4th going white water rafting. Excellent time had by all, except Jakey who insists that because he got soaked by the "rafpids" (sic), it was actually no fun). The kids had a blast drawing sketches and shapes and learning about how to position, plan, and scale their drawings-- it was the best trip to the museum I can remember, they got so into it! They loved the armor and knights, and then after an ill-planned venture into European art 1500-1700 (a bit rough for a four year old's attention, apparently) they sketched some of the reconstructed Roman-era colonnades and pillars.